Non-native eucalpytus (E. globulus) being choked by an even later arrival, Cape ivy (Senecio mikanioides), on Mt. Davidson. The Franciscan region is the smallest region known in California. It's an unrecognized region because it's so small and because there is a city planted on it. 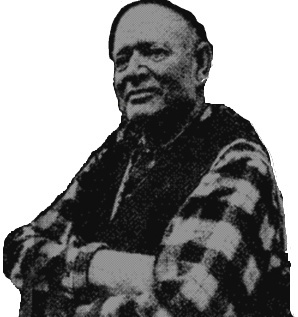 The first man to recognize that there was a Franciscan region was Willis Jepson in his 1925 manual. The Franciscan country starts just south of Muir Woods in Marin County and includes the Marin Peninsula. Montara Mountain in San Mateo County is not Franciscan, it's part of the Santa Cruz Mountains. San Bruno Mountain is a sort of transverse, small range that almost crosses the San Francisco Peninsula just down below the city. Montara Mountain has very little relationship to San Bruno Mountain. You find a nine or ten mile gap between San Bruno Mountain and Montara Mountain, and that gap is flat land. It is not a continuous series of hills from Montara to San Bruno Mountain. This is a very wide separation for mountain ranges. North of Montara Mountain the Franciscan zone begins. The city of San Francisco is planted right in the heart of the Franciscan zone and the geographers, botanists, taxonomists, zoologists have flirted around the edges of the Franciscan not knowing what they were working with. The type of Franciscan is very interesting. 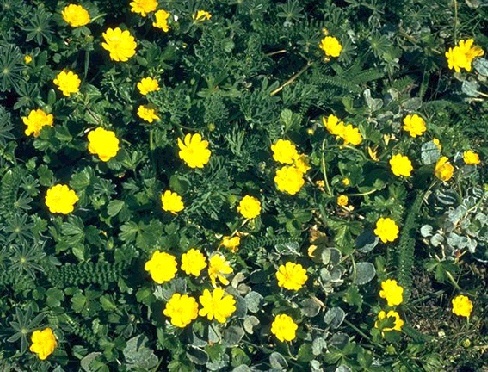 It divides into two types: the Marin type, which is Type II. It's good Franciscan land and most of it is safe now because it is in the Golden Gate National Recreation Area, and as long as no one goes over there and plants pine trees all over the Marin headlands, which I don't think they'll do, we have a good preserve of Franciscan land stretching from Muir Woods south to the Golden Gate. It also stretches up in a small curve towards Stinson Beach. It's on the seaward side. If we preserved the Marin Peninsula and let everything go on the San Francisco side, we'd lose everything. Franciscan country is just fine in its so-called "barrenness," in its bare quality, no trees to speak of except way back in sheltered places. But the type of Franciscan land in Type I, that's in San Francisco. The heart of Franciscan country was right in the center of town, where you had the old 49er cemeteries, where all the rare manzanitas were represented. Also Mt. Davidson, where the Franciscan manzanitas have been exterminated; also the Presidio of SF, where some small remnants of Franciscan land remain. And the sand dunes out here on the Avenues - this is Franciscan country. Mt. Davidson was just about the heart of it, and the whole Franciscan flora was found on the small mountain range in the middle of San Francisco. If [only] the city of San Francisco had preserved Mt. Davidson-to-Sunset Heights-to-Twin Peaks-to-Diamond Hts. just in its natural form, with some small spurs out at the Presidio and down at Hunter's Point, and so on. Now the whole Franciscan Type country has been destroyed with the exception of San Bruno Mountain. 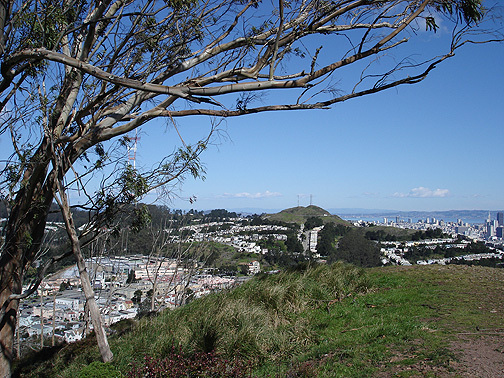 View towards Twin Peaks from Mt. Davidson, 2006. We can't look at the political line, the San Mateo county line, separating San Francisco county from San Mateo county. We have to look at the whole type Franciscan area. And an unspoiled example of that is only on San Bruno Mountain. That's all that is left. Now what sets Type I apart from Type II is the flora. There would be a better fauna in Marin County because deer can range down from the parks back there, maybe even a mountain lion. This is not going to happen on San Bruno which is almost all city-locked. This zone here is unique in the whole world. The conditions that cause it are pretty well known. You have the huge valley inland with tremendous area and high summer temperatures, and out here you have the Pacific, which is, with its prevailing westerlies, always pushing air on to the land. In the wintertime the push comes from storms, but in the summertime, the push comes from fog and wind. This is caused by rising hot air out in the valleys. The hot air rises out there and this causes a pushing and sucking action through the Golden Gate. The wind action is almost constant because you have storms in the winter and you have very cold fog wind pushing in all summer. This area gets very little rest, which causes the Marin and San Francisco oceansides to be treeless. The Franciscan zone gets quite a bit of water. They get all the winter rain that the whole area gets. Over on the west side of the Franciscan peninsulas they also get fog. It's very easy to pervert the Franciscan land because everyone who comes to San Francisco wants a tree in their yard or they want to plant trees on the "bare hills." These hills are not bare, they're rich in animal and plant life, bird life especially. But as soon as they plant pines or eucalyptus on this open Franciscan land, the trees start to catch fog drip and they increase the moisture available to them. The fog isn't trapped, it just goes on over the country having a cooling effect and a slight watering effect, but if you can trap fog, it is just as effective as rain. If you were to get say 30 inches of rain per year on San Bruno Mountain and somebody plants a pine tree up there and the pine catches the summer fog, it's getting 30 inches of winter rain and an additional 10 inches of trapped fog. A 40-inch rainfall produces practically a rainforest effect. It creates what they call "fog forests" up there in the saddle area. Those cypresses up there have leather ferns growing up and down their trunks. These are epiphytes, the marks of a very wet region where ferns grow on tree trunks, that's perverted Franciscan country. The people who inhabit San Francisco are almost always from the East. They look at the Franciscan land and they scorn it. They say, “It's bare, it's bare, we've got to plant something on it.” That's what Sutro did when he was the mayor of San Francisco. He perverted the whole center of the central Franciscan garden of Mt. Davidson, Sunset Hts., Mt. Sutro. He did leave Twin Peaks alone because it was a symbol of the city. Well, Twin Peaks is the least of the Franciscan mountains. It had wildflowers, but it didn't have the flora of Mt. Davidson, Sunset Heights, or Mt. Sutro. You can still find remnants of that flora there, but all the manzanitas are gone. All of the things that made the heart of the Franciscan zone have been subdivided out. And that's what the Crockers, the Foremost Dairy, and the conglomerates are trying to do to San Bruno Mountain. They're trying to wipe it out just the same way. I say that this is a tired old pattern that's been done here. It's ignorant and stupid and it betrays an utter lack of knowledge of the country. The portions of the mountain that may be preserved should never be planted with trees. As soon as you plant trees in Franciscan country, it's no longer Franciscan country. This is a great danger to it. If parts of San Bruno Mountain are made into a park all the scoutmasters up and down the peninsula will be trying to plant pine trees up there. And you have to call out the Ecological Vigilantes, the EV's, on the night of the full moon, out they come. If you're going to preserve Franciscan land you have to take vigilante action. You can't head these guys off in the newspapers or anywhere else. The newspapers support it. Look at McLaren Park, for example. It's Franciscan country and the Examiner and the police department have these planting days up there where the Examiner furnishes the trees, and the police go up there and help the boy scouts plant. I think we got into that once before, over in Buena Vista Park in San Francisco, almost the same day they were planting McLaren Park, the police were demanding that Buena Vista park have the trees taken out of it because so many nurses were getting raped when they walked home in the night from St. Joseph's hospital over to the Haight-Ashbury. So, you have on the one hand these nuts all planting trees, and on the other hand you have the police taking them all out, demanding that they be taken out so they can have an open field of fire on the thugs and rapists. So you have a pretty good selling point there on not planting the area. But San Francisco has always been a home of strangers. We have no gripe against people from New York or New Jersey or Iowa, but our point is that they just don't know what they're looking at. And it's not up to them to lead the way in trying to save Franciscan land, because they don't even know that it exists. It's up to us to show them what this is and why it should be preserved. When the 49ers came to San Francisco, they set up their pads downtown, way downtown up to Kearny Street and around the bayshore there. But one or two of the old-timers were really pretty good botanists and they walked around the bayshore and they talk about this fringe of trees. As soon as they'd get out of town and get towards North Beach, out towards where the Presidio is, the trees were there then. When they walked south down towards Hunter's Point they spoke of this fringe of trees around the Bay area, around San Francisco bayshore. The trees were California Bay, Buckeyes, Poison Oak, Elder and a few others like that. And they formed a green margin around the bay. The last of those [native trees] lingered right here at Point San Bruno up until a few years ago, five or six years ago when Cabot, Cabot and Forbes put their so-called "industrial park" there, filling in a portion of the bay and ruining that little bit of bayshore. ...I don't care what people say. They said the same thing for Mt. Davidson. They said, 'Look at Mt. Davidson, it's not spoiled. For heaven's sake, there's the whole top up there and it has been left in a natural condition,' and blah, blah, blah. Well, it hasn't been. It's absolutely and grossly mutilated. Mt. Davidson has been crowded to the last lot they can carve off of the side of it. It's been grossly perverted with Sutro's stupid eucalyptus trees. He also perverted Sutro Heights out by the Cliff House. And I think that Sutro Heights probably contains some very valuable floristic evidence which we'll never know about. It was probably one of the great endemic areas in the Franciscan zone, and we will never know if anything grows there or not. He has it planted with all his tropical crap. Then, when they get through perverting the country, they hand their pad over to the city and say, 'This is your park,' and they say 'Oh! you're giving us this wonderful park!' I would tell them to keep it. It's just a jungle of perverted Franciscan land. What did grow there? We'll never know. Like I say, these apes come from all over and they don't know what they're doing. They say, 'We made a bluff blossom.' The bluff was blossoming before you got here, Jack! Although the geologists don't give me too much encouragement on this, I think that San Bruno Mountain was once surrounded, almost surrounded by water. What they left out of the Flora (A Flora of the San Bruno Mountains, 1968 by Elizabeth McClintock) is that San Bruno Mountain is probably the greatest sea bluff in the state. They can't see it as a sea bluff because their idea of a sea bluff is something right next to the ocean... You've got seaside daisies growing all over the west face. I have a list of sea bluff plants and you can't differentiate between sea bluff anywhere up and down the coast and leave this out. 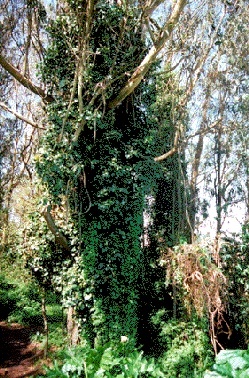 The largest Wax Myrtles in the world used to grow at the lagoon at the end of Lake Merced, the marsh that goes up what's now Brotherhood Way. The Works Project Administration during the Depression in the 1930s, looking for a boondoggle job went in there, cut 'em all down, piled 'em up and walked away. There was no reason for it at all... The Franciscan, as you see, has been under attack for many years and it's almost a miracle that this much of it is left. To get this far and to lose it would be a disaster. We lost Colma Canyon to that road (Guadalupe Canyon Parkway), that was a disaster. That was the last canyon of its kind in the world. Look what it's surrounded with there, three kinds of cherries, for example. You've got Prunus Ilicifolia, holy-leaf cherry, that's evergreen. You've got the deciduous Prunus Virginiana Demissa, and sure enough right here on the west arm you've got Prunus Emarginata, bitter cherry. You know, where do you find these things growing like that? [We should] surround the park headquarters with all the Franciscan plants you can get together in one place. That is the focal point, and that's where the naturalist would tell people the same thing I'm telling today. That this whole region of California that's been neglected and overlooked because its covered by a city.